Professional Welsh landscape artist, Jeff Kirkhouse feels very fortunate that he has the stunning Gower coastline to inspire his unique works. 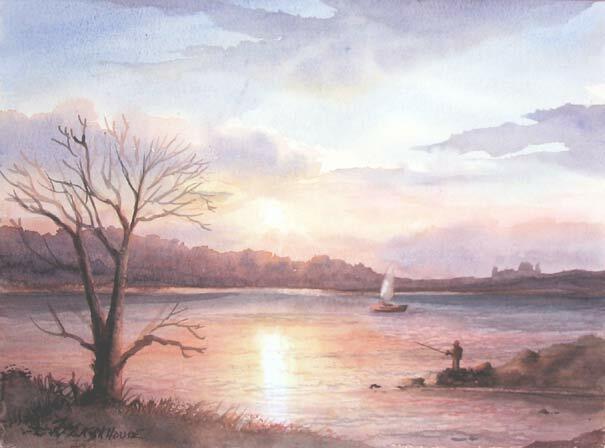 Not only does he excel in painting landscapes, he also takes advantage of the many historical buildings in both Wales and England to produce beautiful water colours, such as Dylan Thomas's famous boathouse at Laugharne, and the magnificent castles of Cardiff and Caernavon to name but a few. "The watercolours of Jeff Kirkhouse are much sought after, and his interpretation of his chosen work leaves the lasting impression of Serenity and beauty of the natural sights of the landscape." Thank you for visiting my web site. I hope you will find something of interest. If so please let me know by email or personal contact by telephone. All images on this site are watermarked - the originals are not!